Since 1899, Speedball nibs have been made with the finest steel and feature a range of sizes and styles suited to any calligraphy or drawing project. easy to use as a regular brush. Left-handed versions of the popular 'C' style are labelled 'LC' for easy reference. Flexible nibs offer various line widths and degrees of stiffness to give you perfect control. 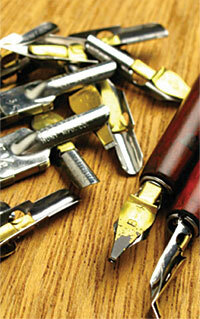 Flexible Pen point nibs (#56 to #513EF) $2.20 - $3.95 each. The set features 9 assorted nibs and two holders. It is excellent for lettering, calligraphy, poster-making, cartooning, sketching and mapping. This set features 6 assorted flexible nibs and two penholders. It is excellent for lithography, delicate lines,cross-hatching and fine details. Penholders(plastic or wood, various styles) $2.23 to $5.48 each. Set includes one or two 12ml bottles of ink, pen holder and nib(s). Panache BASIC Calligraphy Fountain Pen set (with four ink refills) $25.95 each. Panache MASTER Calligraphy Fountain Pen set (with four ink refills) $38.95 each. Excellent for drawing,calligraphy, stamping,and airbrushing; this ink is waterproof, lightfast, acid-free and archival. All 2oz colours and pen cleaner are $7.82 each. This ink is waterproof and free-flowing (non-clogging) with superior lightfastness which makes it ideal for drawing,cartooning,lettering,calligraphy, airbrushing, and scratchboard art. Speedball Super Black India Ink contains 100% carbon black pigment-no dyes.